Kick off your visit on the 4th (Thu): take in nature's colorful creations at Denver Botanic Gardens. To see other places to visit, maps, and more tourist information, use the Denver vacation maker tool . Newark to Denver is an approximately 5.5-hour flight. You can also do a combination of train and flight; or drive. The time zone difference moving from Eastern Standard Time (EST) to Mountain Standard Time (MST) is minus 2 hours. Expect slightly colder evenings in Denver when traveling from Newark in July, with lows around 60°F. Finish up your sightseeing early on the 4th (Thu) so you can catcht the bus to Colorado Springs. On the 5th (Fri), identify plant and animal life at Garden of the Gods. To see photos, traveler tips, ratings, and other tourist information, read our Colorado Springs online sightseeing planner . Take a bus from Denver to Colorado Springs in an hour. Alternatively, you can drive; or do a combination of train and flight. Expect a daytime high around 86°F in July, and nighttime lows around 58°F. On the 5th (Fri), wrap the sightseeing up by early afternoon so you can travel to Salt Lake City. On the 6th (Sat), contemplate in the serene atmosphere at Temple Square and then take in breathtaking views at Big Cottonwood Canyon. For traveler tips, more things to do, where to stay, and tourist information, read our Salt Lake City online journey maker . Getting from Colorado Springs to Salt Lake City by flight takes about 3 hours. Other options: do a combination of shuttle and flight; or drive. Traveling from Colorado Springs in July, expect Salt Lake City to be somewhat warmer, temps between 95°F and 70°F. 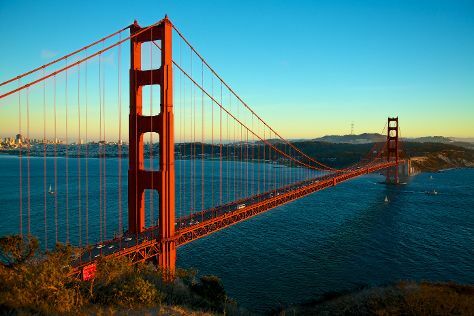 On the 7th (Sun), wrap the sightseeing up by early afternoon so you can travel to San Francisco. Kick off your visit on the 8th (Mon): snap pictures at Golden Gate Bridge, then stroll through Golden Gate Park, and then admire all the interesting features of AT&T Park. On the 9th (Tue), you'll have a packed day of sightseeing: take a leisurely stroll along Fisherman's Wharf and then head off the coast to Alcatraz Island. To see traveler tips, reviews, maps, and other tourist information, read our San Francisco sightseeing site . You can fly from Salt Lake City to San Francisco in 4 hours. Other options are to do a combination of flight and subway; or drive. The time zone difference when traveling from Salt Lake City to San Francisco is minus 1 hour. Traveling from Salt Lake City in July, expect nights in San Francisco to be a bit cooler, around 57°F, while days are cooler, around 73°F. Finish up your sightseeing early on the 9th (Tue) so you can travel to Los Angeles. Start off your visit on the 10th (Wed): make an unforgettable trip to Disneyland Park. You can do a combination of flight and train from San Francisco to Los Angeles in 4.5 hours. Alternatively, you can do a combination of subway, flight, and train; or drive. Prepare for somewhat warmer weather when traveling from San Francisco in July: high temperatures in Los Angeles hover around 83°F and lows are around 66°F. Wrap up your sightseeing on the 10th (Wed) to allow time to drive to San Diego. On the 11th (Thu), stroll through San Diego Zoo. Quickly create a custom-made itinerary for San Diego using our trip planner. You can drive from Los Angeles to San Diego in 2.5 hours. Other options are to take a bus; or fly. Expect little chillier weather when traveling from Los Angeles in July: highs in San Diego hover around 77°F, while lows dip to 68°F. Wrap up your sightseeing on the 11th (Thu) early enough to travel to Phoenix. Phoenix is the capital and most populous city of the U.S. Start off your visit on the 12th (Fri): see the interesting displays at Musical Instrument Museum. Ask Inspirock to suggest an itinerary and make planning a trip to Phoenix fast, fun, and easy. Getting from San Diego to Phoenix by flight takes about 3 hours. Other options: drive; or take a bus. Due to the time zone difference, you'll lose 1 hour traveling from San Diego to Phoenix. When traveling from San Diego in July, plan for much warmer days and somewhat warmer nights in Phoenix: temperatures range from 106°F by day to 85°F at night. Wrap up your sightseeing by early afternoon on the 12th (Fri) to allow time for the car ride to Grand Canyon National Park. On the 13th (Sat), trek along Bright Angel Trail. Keep things going the next day: get great views at Mather Point and then take in breathtaking views at Grand Canyon South Rim. Traveling by car from Phoenix to Grand Canyon National Park takes 4 hours. Expect colder temperatures when traveling from Phoenix in July; daily highs in Grand Canyon National Park reach 84°F and lows reach 52°F. Finish your sightseeing early on the 14th (Sun) to allow enough time to drive to Santa Fe. Kick off your visit on the 15th (Mon): admire the masterpieces at Georgia O'Keeffe Museum, take in the architecture and atmosphere at The Cathedral Basilica of St. Francis of Assisi, then get to know the fascinating history of Canyon Road, then take in the spiritual surroundings of Loretto Chapel, and finally take a memorable drive along The Plaza. To see photos, where to stay, maps, and other tourist information, you can read our Santa Fe road trip site . You can drive from Grand Canyon National Park to Santa Fe in 7 hours. Expect a bit warmer evenings in Santa Fe when traveling from Grand Canyon National Park in July, with lows around 60°F. Wrap up your sightseeing by early afternoon on the 16th (Tue) to allow time for travel back home.